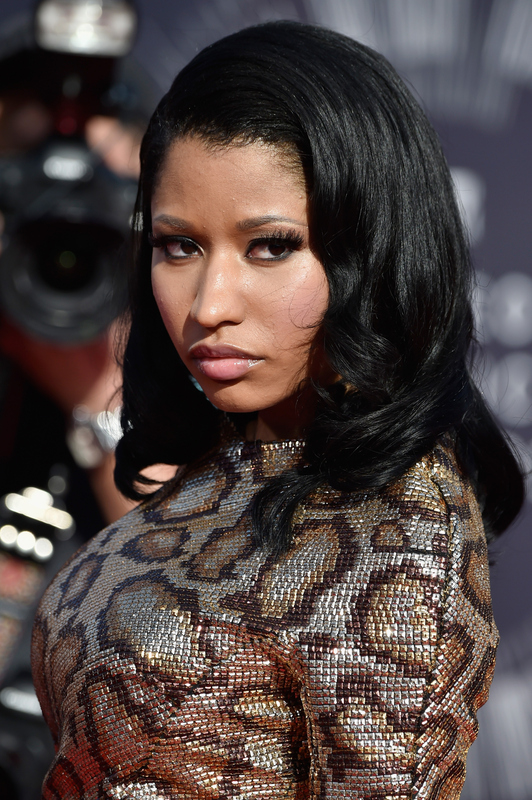 Historically, Onika doesn't play around when it comes to her red carpet ensembles. However, tonight miss Minaj looks surprisingly conservative. At the MTV VMAs, Nicki Minaj wore a sequin minidress that hugged her curves in a stellar manner. This outfit is, in a surprising turn of events for the rapper's style track record, totally wearable cocktail attire. Perhaps she was too tired to choose a crazy outfit after all of that twerking in the "Anaconda" video. While she isn't nominated for any silver astronauts this year, the first lady of Young Money will take the stage tonight to perform. Just speculating, but I'm thinking we're gonna see her turn it out to her new single "Bang Bang" along with Jessie J and Ariana Grande. The long-sleeved animal print sheath she's rocking tonight represents Nicki 2.0, a pared down Minaj with no need for a wig master. Sure, this year's outfit can be described as relatively tame compared to Nicki's canon of strange VMA fashion. Who can forget the time she wore a feat of 30th Century architecture and brought her invisible dog to the Video Music Award red carpet in 2011? Jeez, that was bizarre. Or how about 2012 when she donned a lace catsuit to the ceremony, complete with a yellow wig and pink highlights? However, it appears that a leopard can indeed change her spots.